Wow! We’d like to thank all of our wonderful customers who supported us in the 2015 Avi Choice Awards – Trompe Loeil won an astounding 4 Resident’s Choice categories last night! 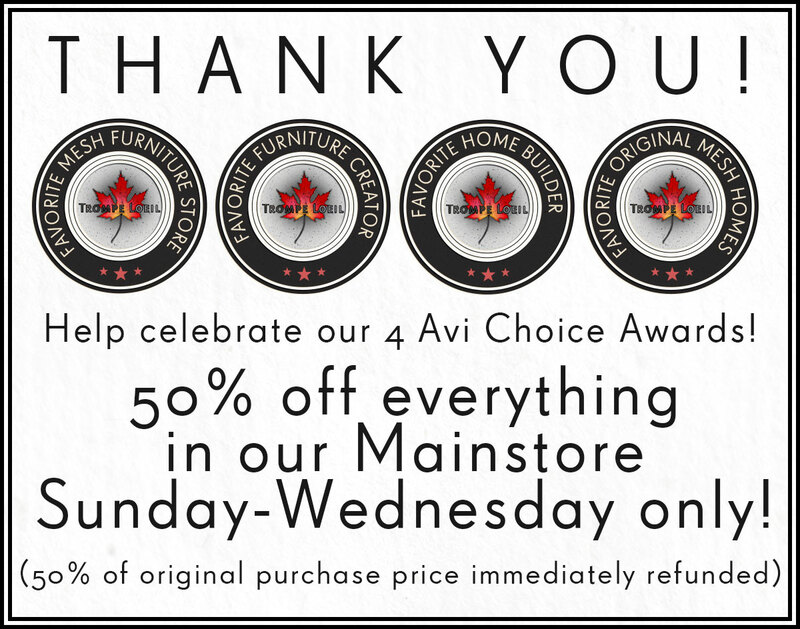 To celebrate, take 50% off the entire Mainstore (excluding gift cards and gift card top-ups) until Wednesday night, its our way of saying “thanks”! Trompe Loeil only exists because of the support of our wonderful friends, fans, and customers. Without you, we couldn’t continue to do what we love – create the best mesh furniture and homes with care and flair. We are so honored by this recognition, and look forward to another great year of creating the home and garden items that you love!